Our engagement was no surprise. So, here's what happened when we did make it official. Angel arrived in Malaysia to visit my family on June 30th, 2010. This was his first time meeting my family, and this was the first time we'd seen each other in over three months. As is usual for my family, we didn't let him rest for a minute, but started showing him around town immediately. That same evening that he arrived, Angel asked my parents if the two of us could go for a walk on the beach, without the other kids tagging along. (My baby sisters had decided that he was their new best friend and practically refused to let go of him the entire two weeks he was there). Mom and Dad restrained the little girls, and we walked down to the beautiful, garbage-covered beach that is outside my home, and wandered around for a bit. Fifteen minutes later, we headed back into the house, and as I opened the door, I could tell by the looks on the faces of my parents and my siblings that they were convinced that Angel had asked me to walk on the beach because he was going to propose. They were all ready to burst out with "Congratulations!! Can we see the ring?" I immediately started drawing my finger across my neck in an urgent message of "Abort! Abort! No proposal has been made." The family was highly disappointed, and I have to admit, I also wondered about Angel's intentions. I'm usually a very direct person, but if he had some sort of proposal plan, I didn't want to ruin it with questions, so I didn't ask anything. As I found out much later, he had a plan all along. Angel had decided that he didn't want to propose to me until two days after he'd been in Malaysia, to allow the worst of the jet lag to be over with, so that he would know for sure that he didn't propose under the influence of jet lag. Seems reasonable, but honestly, the wait was almost unendurable. On July 2nd, Angel spoke to my Dad about his plan, and we all went out for breakfast. Only, Mom and Dad dropped Angel and I off at an Indian restaurant, and took the rest of the family to McDonald's for breakfast. I can still remember their leering, grinning faces as they knowingly waved to us through the car windows as Dad drove away. We had a delicious breakfast of roti canai and curry--to this day, that restaurant is Angel's favorite restaurant in the whole world. Then I suggested that we walk over to an acupressure path that was nearby. If you've never had the experience of walking on an acupressure path--it's a path made out of pointy rocks that you are supposed to walk on barefoot. It is thought by some to be healthy for you. My siblings and I liked to challenge each other to races around the path--which led to bruised feet. I challenged Angel to a race around it so that he could feel how painful it was. Afterwards, he wanted to call his parents who he hadn't spoken to since arriving, so I lent him my cell phone. I didn't speak any Spanish at that time, so I have no idea what he said. Then we used my camera to take some self-timer pictures. After that, he got a box out of my little brother's backpack that he'd been mysteriously carrying around with us, got down on one knee and said, "I do love you and I want to spend the rest of my life with you, so will you marry me, Honey?" I said "Yes" before he finished asking the question, and we walked back to my house in a glow--already talking about when we should get married (at this point, the plan was for June 2011--this was before we discovered that being engaged is not fun). We arrived back home, and my family had already returned from McDonald's. Once again, I could tell that they were waiting to spring upon us with "Congratulations!" but this time, there was no "Abort!!" signal. I completely understand the "planning the wedding without a ring" thing. Dean and I started planning our wedding in December but there was no proposal until June. I love a good proposal story! Thanks for sharing. Aww :) You guys are just perfect together! Cute! I love hearing engagement stories! They are just so much fun! We did the planning our wedding without being engaged too. I bought my dress almost two months before Hal proposed. Being engaged is the worst! We were engaged for about 5 months and that seemed likt it was forever. That's so cool that Angel came all the way to malasyia to propose! You two are so cute :) How long did your engagement last? haha..our's changed from a year to 6 months! I love your proposal story! Cute pictures of you guys, too. And I agree - being engaged is NOT fun. We had a 6 month engagement. I would have liked for it to be shorter, but it was the perfect amount of time - any less and I wouldn't have had anything ready, planning a wedding on an Alaskan island is nearly impossible. What a nice engagement story! I don't get why being engaged isn't fun? You look so cute in that picture! And kudos to him for traveling all the way to Malaysia to meet your family! Aww, what a sweet story! You two are adorable! I didn't realize the first time he visited your family it was in Malaysia! cute story! Aw what a cute story! Your family must have been nearly as anxious as you waiting to find out the good news! "I immediately started drawing my finger across my neck in an urgent message of "Abort! Abort! No proposal has been made." <-- so funny! 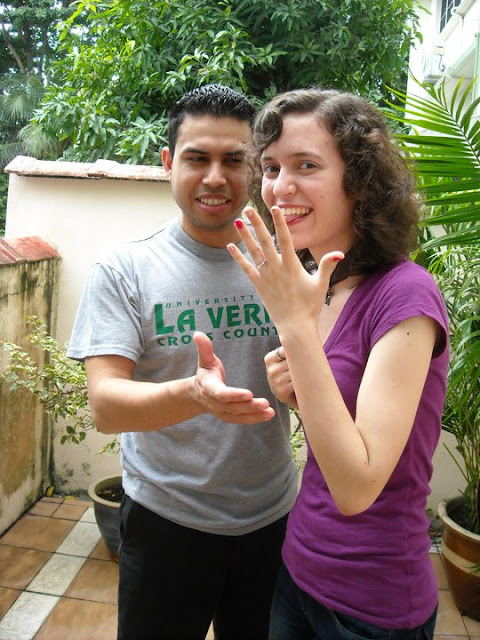 Glad he proposed in a way that you weren't expecting! Makes a much better story! Aww, that's cute that he waited to propose until after the jet lag wore off. But I can definitely see how it was a difficult wait for you. It's a great story! I have nothing more to say than I love this story!